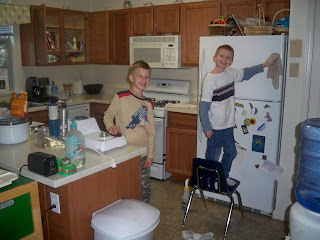 We've taken a break from our normal school/cleaning schedule to do some cleaning out, organizing and spring cleaning! Last week we went through a few rooms really cleaning out and going through stuff, this week we're doing more of the same but also some deep cleaning. through the cupboards organizing and de-cluttering. 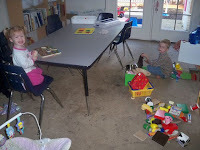 Mr. S had the job of cleaning (wiping down) the play kitchen and Miss J wiped off the school table and then did puzzles. In the next couple of days we hope to get to the play room, bathrooms and the van. We'll see how much we get done this week and if other spots are found that need work.